"Six drivers set for biggest event of the season"
November 17, 2013 - Unionville, Ontario - As the 2013 karting season begins to wind down, Pserra Racing is set to make an attack on the annual Superkarts! USA (SKUSA) SuperNationals. As the biggest event in North American karting approaches, PSerra Racing will enter six drivers in the prestigious event that will take place on the grounds of the RIO All-Suites Hotel and Casino in Las Vegas, Nevada. Travelling to 'Sin City', Pserra Racing will have an international lineup with five drivers making the trek from Australia and one sole entrant from Canada. "We have six drivers in the Pserra Racing tent and all have the speed and experience to run at the front of their respective fields," explained Rich Hibbs. "We are excited to get to Vegas and get the event started." Entering five drivers in the TaG Cadet ranks, the team will be led by Rotax Mini Max Canadian National Champion Antonio Serravalle. As one of the drivers to beat in the 2013 edition of the event, Serravalle will look to improve one position more and stand atop the podium in Las Vegas as he claimed Vice Championship honors in 2012. Pserra Racing will also have four drivers from Australia in the TaG Cadet division in Austin Wells, Broc Freeney, Jack Doohan and Declan Fraser. All four drivers are respective front runners down under and should be considered contenders for the SuperNats crown. With a pair of Rotax classes making their debut at the SuperNationals in 2013, Pserra Racing will enter one driver in Rotax Junior. Flying the Pserra flag in the junior class will be Zane Goddard. Hailing from Australia, Goodard will enter Vegas off the radar but will hope to make a name for himself come championship Sunday. Pserra Racing is also pleased to announce a new dealer to the Tony Kart and OTK family. 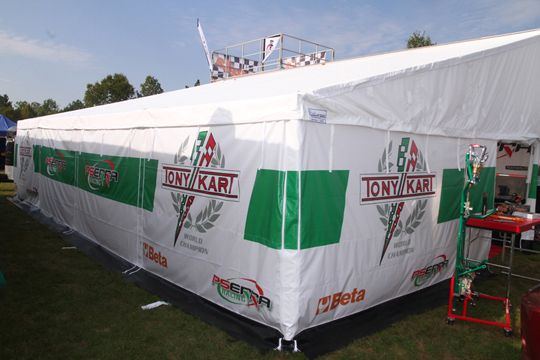 Located near Trois-Riveries, Quebec, SC Performance Karting will begin to promote and sell the Tony Kart product line. With the track in the city of St-Celestin, Quebec, the newly formed company and facility will open in the spring and help continue the winning traditions of Tony Kart. For more information about Pserra Racing, the Pserra Racing team, the Tony Kart chassis line, Beta tools and OTK parts, as well as Pserra's engine program and arrive and drive programs, please visit their website, www.pserraracing.com or contact them via e-mail to Rich@PserraRacing.com or call 905.888.6400, toll free at 1.877.880.6455.